A homily of Saint Augustine about the two miraculous catch of fish narrated in the Gospels. The fishing of our Saviour is our salvation. Moreover, we notice two fishing incidents in the holy Gospel of our Lord, that is, times when the nets were lowered at His word: one earlier when He chose the disciples, and the other when He had risen from the dead. That earlier fishing incident showed what the nature of the Church is now; the one which took place after the Resurrection of the Lord showed what the nature of the Church is going to be at the end of this world. Finally, in that earlier fishing, He bade the nets to be lowered without saying in what direction; He simply ordered them to be lowered. The disciples obeyed; there was no direction specifying to the right nor was there any direction specifying to the left. For the fish represented men. If, therefore, He had said to the right, only the good were going to be included; if He had said to the left, only the wicked would be taken. In fact, it was because both good and bad were going to be mixed together in the Church that the nets were lowered without any distinction, so that fish might be taken indiscriminately, signifying the mixture of the good and the bad. Furthermore, the statement is also made in the same passage that they took so many fish that the two boats were filled and were about to sink, that is, they were weighed down to the sinking point (cf Lk 5:1-7). As a matter of fact, those two boats did not sink, but they were in danger of doing so. Why were they in danger? Because of the large number of fish. 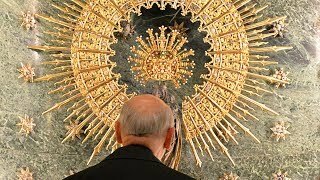 In this way it was pointed out that, by reason of the large number of people which the Church would gather, her discipline would be endangered. Besides, a statement was added to the account of the fishing relating that the nets were broken on account of the large number of fish. What did broken nets signify except future schisms? Turn your attention now to the account of the other fishing incident which was read aloud today. For that happened after the Resurrection of the Lord to indicate what the nature of the Church would be after our resurrection. The Lord said: Cast the net to the right side (Jn 21:6). Therefore, the number of those who will stand on His right hand was determined, for you remember that the Lord said that He will come with His angels, that all nations will be gathered before Him, that He will separate them as the shepherd separates the sheep from the goats, that He will set the sheep on His right side and the goats on the left, and that He will say to the sheep: Come, receive the kingdom, and to the goats: Go into everlasting fire (cf Mt 25:31-42). The nets were cast to the right, and the disciples were not able to raise them because of the large number of fish. In the previous incident the word multitude was used, but here a definite number was specified – both multitude and magnitude; there, however, the number was not mentioned…. What follows? He continues: They hauled the nets to the shore (Jn 21:11). 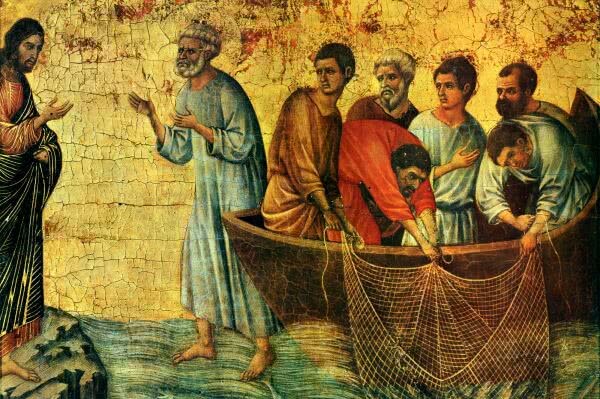 Just now, when the Gospel was read aloud, you heard that Peter hauled the nets to the shore. When you hear shore, understand the end of the sea; when you hear the end of the sea, understand the end of the world. In the earlier fishing, the nets were not hauled to the shore; but the fish that were taken were poured into the boats. However, in this incident they hauled the nets to the shore. Hope for the end of the world. The end is going to come to the advantage of those on the right, to the disadvantage of those on the left. And how many fishes were there? They hauled in the nets which held one hundred fifty-three fishes. In addition, the Evangelist notes a necessary detail: And though they were so great, that is, so large, the net was not torn. They will be great, but there will not be heresies; and it is for the very reason that they will be great that there will not be heresies. Who are the great? Read the words of the Lord Himself in the Gospel and you will find who are the great. For He says: I have not come to destroy the Law and the Prophets, but to fulfil them (Matt 5:17). Nevertheless, the Church is called the kingdom of heaven. And, inasmuch as the sea has both good and bad fish swimming about at the same time, in that kingdom of heaven, that is, in the Church of our times, he is called least who teaches good things but does evil, because such people are there also. Yes, such a one is there; he is there in the kingdom of heaven, that is, in the Church as she exists in our times. He teaches good things; he does evil. He is a member, but he is a hireling. Amen I say to you, the Lord says: they have received their reward (Mt 6:2). Such a person is of some good, for if they who teach good things and do evil were of no use, the Lord Himself would not have said to His people (cf Mt 23:2-4): The Scribes and the Pharisees sit on the chair of Moses. Do what they say; do not do what they do. Why? For they talk, but do nothing. Therefore, let your Charity be attentive, for I desire to explain to you whom these great fishes represent: Whoever has done away with one of these least commandments, shall be called least in the kingdom of heaven. He will be there, but he will be least. But whoever has carried them out and has so taught them, he shall be called great in the kingdom of heaven. Behold, those are the great fishes taken on the right side. Whoever has carried them out and has so taught them: he has done good things; he has taught good things; he has not contradicted his own instructions by evil living, having a good tongue in spite of his evil life. Therefore, whoever has carried them out and has so taught them, he shall be called great in the kingdom of heaven. And Scripture continues: For I say to you that unless your justice exceeds that of the Scribes and Pharisees, you shall not enter the kingdom of heaven (cf Mt 5:19-20). Now, how do you understand the words kingdom of heaven here? As that place of which the Scripture says: Come, blessed of my Father, receive the kingdom (cf Matt 25:34). Unless your justice exceeds that of the Scribes and Pharisees – what does exceeds that of the Scribes and Pharisees mean? Recall those Scribes and Pharisees who sit on the chair of Moses, of whom the Scripture says: Do what they say; do not do what they do; for they talk, but do nothing (cf Mt 23:1-5). Hence, the justice of the Pharisees is to talk and not to do. Let your justice exceed that of the Scribes and Pharisees so that you may both speak well and live well. Now, therefore, what need is there of repeating the same statements about the number of the 153 fishes? You know all that. A gradually increasing number derives from ten and seven. Begin with one, go on to seventeen in such a way that you add all the intervening numbers, that is, add one to two, and it becomes three; add three, and it becomes six; add four, and it becomes ten. In this way add all the numbers up to seventeen, and the total is 153. Hence, our whole attention ought to be directed to nothing else except the significance of ten and seven, for therein lies the foundation of the 153. Now, what is the significance of the ten and the seven? Understand the ten as in the Law. Ten precepts were given first; the Decalogue was inscribed by the finger of God on tablets. In the ten, understand the Law; in the seven, understand the Holy Spirit, for the holy Spirit is presented in sevenfold form. On that account, sanctification is not mentioned in the law until the seventh day. God made light; the Scripture does not say: He sanctified it. He made the firmament; it does not say: He sanctified the firmament. He separated the sea from the earth; He ordered the earth to bud forth; it does not say: He sanctified it. He made the moon and the stars; it does not say: He sanctified them. He ordered living things that swim and fly to come forth from the waters; it does not say: He sanctified them. He ordered four-footed animals and all creeping things to come forth from the earth; it does not say: He sanctified them. He made man himself; it does not say: He sanctified him (Gen 1:1-31). We have reached the seventh day whereon He rested; and He sanctified it (cf Gen 2:3). By His rest, God sanctified our rest. Therefore, our complete sanctification will be there where we shall rest eternally with Him. But why should God rest, for He was not wearied by His work? If you were to accomplish things by a mere word, you would not be tired; if you should give a direction and should find it carried out immediately, you would stay at rest, you would remain fresh. He spoke a few words by which He made all things, and was He suddenly wearied? Hence, understand that the Law is represented by the ten; understand that the Holy Spirit is represented by the seven. Let the Spirit be joined to the Law, because, if you have received the Law, and if you lack the help of the Spirit, you do not fulfil what is of the Law, you do not carry out what is commanded you. Moreover, man under the Law is held as a prevaricator. Let the Spirit be added, let Him help: that which is commanded is accomplished. If the Spirit is absent, the letter kills you. Why does the letter kill you? Because it will make you a prevaricator. You cannot excuse yourself on the plea of ignorance since you have received the Law. Now, because you have learned what you should do, ignorance does not excuse you; the Spirit does not help you: therefore, you are ruined. But why does the Apostle say: The letter kills, but the spirit gives life? (2 Cor 3:6). How does the Spirit give life? Because He causes the letter to be fulfilled so that it may not kill. The sanctified are those who fulfil the law of God according to the gift of God. The Law can command; it cannot help. The Spirit is added as a helper, and the commandment of God is fulfilled with joy and delight. Certainly many observe the Law from fear, but those who keep the Law from fear of punishment would prefer that what they fear did not exist. On the contrary, those who observe the Law through love of justice rejoice even in that respect because they do not consider it hostile to them. On that account the Lord says: Come to terms with your opponent quickly while you are with him on the way (Mt 5:25). Who is your opponent? The word of the Law. What is the way? This life. How is the word of the Law an opponent? It says: You shall not commit adultery, and you wish to commit adultery. It says: You shall not covet your neighbour’s goods, and you wish to steal the property of another. It says: Honour your father and your mother, and you are insolent to your parents. The Law says: Do not bear false witness, but you do not refrain from lying. When you see that the Law commands one thing and you do another, the Law is your opponent. You have a destructive adversary; let it not enter into intimacy with you; come to an agreement while you are on the way. God is near at hand to reconcile you. How does God reconcile you? By forgiving your sins, and by implanting justice so that your words may become good. Therefore, when you have come to terms with your opponent, that is, with the Decalogue of the Law through the Holy Spirit, you will arrive at the ten and the seven. When you have come to the ten and the seven, then the number will increase to 153. You will deserve to be crowned on the right side; do not remain in the left side to be condemned.